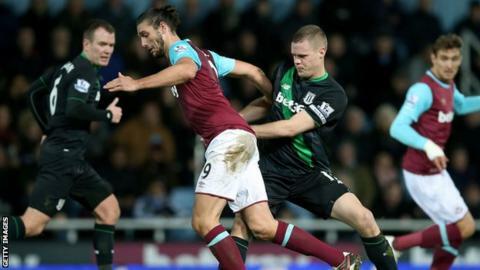 West Ham were held by Stoke in a scrappy but entertaining goalless draw. The visitors produced an impressive attacking display to beat Manchester City last week, but could not find the same form again. Marco van Ginkel, brought in for the injured Xherdan Shaqiri, had Stoke's best chance in the first half but he put wide from close range. West Ham enjoyed more action in front of goal but they were denied time after time by Stoke goalkeeper Jack Butland. It means the Hammers have now gone six games without a win in the league - their last victory coming against Chelsea on 24 October - although they have picked up four draws in that period. Stoke City have now kept seven clean sheets in their last nine Premier League games. The draw saw the hosts slip one place to eighth while the Potters remain 11th. Stoke were dealt a blow before the game when Shaqiri was ruled out with a hamstring strain, and they lacked the attacking prowess they showed in their 2-0 win last weekend. Van Ginkel should have done better when he scuffed wide from Ibrahim Afellay's pass in the first half, while substitute Mame Diouf nearly won it at the end when he went one-on-one with keeper Adrian, who saved with his feet. Bojan was ineffective up-front, having only two shots all game, while Marko Arnautovic failed to produce the same finishing that saw him score twice against Man City. Although they lacked attacking flair, their defence was solid once again, with Butland making eight saves. West Ham have been hit by a number of injuries to key players in recent weeks - the latest casualties Winston Reid and Victor Moses joining Dimitri Payet, Diafra Sakho and Manuel Lanzini on the sidelines. Manager Slaven Bilic called upon Michail Antonio to make his first Premier League start, and the former Nottingham Forest attacking midfielder impressed for the Hammers. The 25-year-old had five shots on goal - more than any other player on the pitch - but failed to put it past an in-form Butland. Andy Carroll made a menace of himself up front, and engaged in a physical battle with defender Ryan Shawcross, but the big England striker was not able to find the killer touch, with only two shots on target. West Ham boss Slaven Bilic: "Both teams defended well. We hit the post twice and they did once. I'm not happy with the result but it was a fair result. "Considering the effort we put in I can't be unhappy with my team. "I can't be happier with our spirit and togetherness and resilience and, at times, our quality." Stoke manager Mark Hughes: "We're reasonably pleased with the draw. "I thought we defended really well. Both teams will be comfortable with the point. That's something we can build on. "[The clean sheet record] is a base and platform to build on. West Ham are a good team and as the home side we knew it was a test for us." No keeper has kept more clean sheets in the Premier League than Jack Butland this campaign (seven, level with Joe Hart). He also has the best saves-to-shots ratio in the Premier League so far in 2015-16 (82.5%). The Potters have not conceded a Premier League goal while Ryan Shawcross has been on the pitch this season (497 minutes). West Ham have won just two of their last nine Premier League home games (W2 D4 L3), but are unbeaten in the last six. The Hammers have kept back-to-back clean sheets twice this season. They also did it against Liverpool and Newcastle in August/September. West Ham face managerless Swansea at the Liberty Stadium on Sunday, 20 December while Stoke welcome Crystal palace the day before. Match ends, West Ham United 0, Stoke City 0. Second Half ends, West Ham United 0, Stoke City 0. Attempt blocked. Cheikhou Kouyaté (West Ham United) header from the right side of the six yard box is blocked. Corner, West Ham United. Conceded by Ryan Shawcross. Attempt missed. Enner Valencia (West Ham United) right footed shot from more than 35 yards is too high. Assisted by Mauro Zárate. Corner, Stoke City. Conceded by Enner Valencia. Corner, Stoke City. Conceded by Angelo Ogbonna. Attempt saved. Mame Biram Diouf (Stoke City) right footed shot from the centre of the box is saved in the centre of the goal. Assisted by Marko Arnautovic. Attempt saved. Enner Valencia (West Ham United) right footed shot from outside the box is saved in the top centre of the goal. Attempt blocked. Mauro Zárate (West Ham United) left footed shot from outside the box is blocked. Assisted by Nikica Jelavic. Substitution, West Ham United. Nikica Jelavic replaces Michail Antonio. Attempt saved. Enner Valencia (West Ham United) header from the centre of the box is saved in the bottom left corner. Assisted by Andy Carroll with a headed pass. Mauro Zárate (West Ham United) hits the right post with a right footed shot from outside the box. Assisted by Michail Antonio. Attempt blocked. Michail Antonio (West Ham United) right footed shot from the centre of the box is blocked. Assisted by Cheikhou Kouyaté. Attempt blocked. Mame Biram Diouf (Stoke City) left footed shot from the centre of the box is blocked. Attempt blocked. Charlie Adam (Stoke City) left footed shot from outside the box is blocked. Assisted by Mame Biram Diouf. Attempt missed. Bojan (Stoke City) left footed shot from the right side of the box misses to the left. Assisted by Jonathan Walters. Attempt saved. Mame Biram Diouf (Stoke City) left footed shot from the centre of the box is saved in the centre of the goal. Assisted by Glen Johnson. Corner, West Ham United. Conceded by Mame Biram Diouf. Mauro Zárate (West Ham United) wins a free kick in the defensive half. Attempt missed. Mark Noble (West Ham United) right footed shot from outside the box is just a bit too high. Assisted by Mauro Zárate. Attempt saved. Andy Carroll (West Ham United) header from the centre of the box is saved in the centre of the goal. Assisted by Mauro Zárate with a cross. Substitution, Stoke City. Charlie Adam replaces Geoff Cameron. Attempt missed. Bojan (Stoke City) right footed shot from the left side of the box is too high following a set piece situation. Substitution, Stoke City. Jonathan Walters replaces Ibrahim Afellay.